Brought up in the crofting village of Sollas, North Uist. 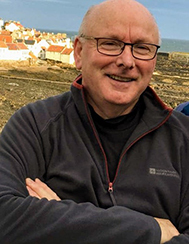 Now retired from a career in social work after working for Strathclyde Regional Council, Church of Scotland Board of Social Responsibility and Comhairle nan Eilean. Now living in Upper Coll, married with two children and one grand daughter. Cancer has affected my family, friends and colleagues over many years and I have also seen its impact on others through my social work career. These experiences make me very keen to give my support to the great work of WICCI and Macmillan.